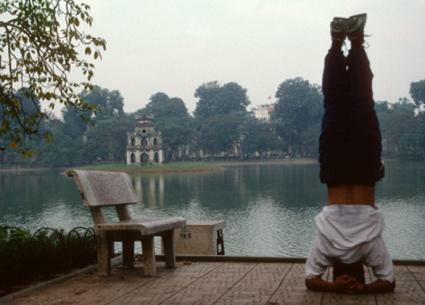 Supported Headstand, or Salamba Sirsasana, is a strengthening pose that, with concentration, is accessible for someone at an intermediate skill level. Salamba Sirsasana is derived from the Sanskrit word for "head," sirsa, and salamba, which translates to "with support." If you want to deepen the pose, come up off the forearms. Begin in Child's Pose, head resting on a mat or blanket. Clasp your hands together, forearms on the floor, head between your fingers. On an inhale, come up off the floor by moving your feet closer to your head, heels up, shoulder blades down into your back. Exhale, and lift the legs up and together, activating the thighs firmly. Extend the legs upwards, unfolding at the knee, toes pointed. Don't arch your back. Stretch your legs upward to avoid compressing the tailbone. Hold the pose for 10 seconds or more, based on your level. Slowly come out of the pose by curling the legs down in a fluid motion, and release into Child's Pose. 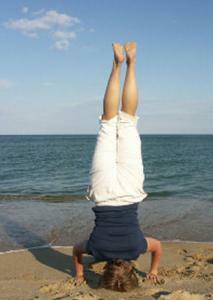 For more instruction on Supported Headstand, visit Yoga Journal. Practice this pose against a wall to avoid placing too much weight on the head and neck. It's better to put more weight on your arms and only hold the pose for a few seconds than to risk injury. Rise up onto your extended hands, instead of resting on the forearms, or extend your time.